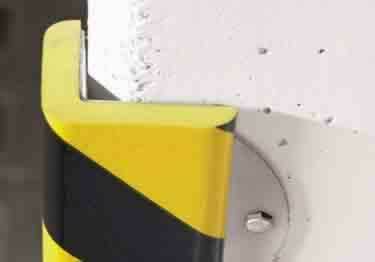 Protruding corners, edges, and objects create a real hazard in the workplace. Increase safety by covering those corners and edges with Bumper Corner Guards, made from flexible polyurethane foam that absorbs the force of impact and gently bounces back. Bumper Corner Guards protect corners, employees and equipment from impact injuries. Available in nine types and a variety of colors. The photoluminescent color version even provides long-lasting luminance for increased visibility in case the lights suddenly go out. Most guards are self-adhesive. Type A+ and H+ come with steel support and anchors mounting system option. Protruding corners, edges, and objects create a real hazard in the workplace. Increase safety by covering those corners and edges with Bumper Corner Guards, made from flexible polyurethane foam that absorbs the force of impact and gently bounces back. I am the manager at an independent senior apartment community. I have been searching the internet for reasonably priced corner guards (that weren't 1/8" thick) as I needed them for cement posts in our parking garage of our senior apartment building. I was very surprised when this piece arrived. First, it was packaged beautifully in a sturdy box, so it was not destroyed in shipping. And second, it had a good amount of thickness to the guard. That is something I needed with senior drivers trying to navigate concrete poles in a parking garage. No offence seniors.... I get it. It's hard to see a concrete pole if it's not brightly guarded. I don't think these will stop a car from damage if they hit one of the poles, however I do believe we mostly corner guard them for the visual help when parking. I would purchase these again! Thank you for your very detailed review. We very much appreciate you taking the time to provide your feedback. Also thank you for mentioning our great packaging and the quality characteristics of our guards. Reduce injury & protect equipment, machinery, & walls from damage. Safety Guards are available in 6 colors, 7 types, & 8 sizes.